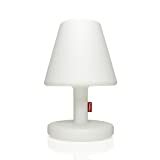 This cool new Fatboy Edison Giant is a minimalist / modern / massive floor lamp that can be used indoors or outdoors and has a unique color temperature regulator to adjust the light intensity color to suit your mood. 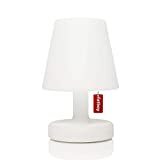 This huge, six foot tall standing lamp has a red label hanging down from the integrated lampshade that is twisted to control the LED light color temperature from a colder whitish blue 5000 K for work areas to a warmer yellow 2100 K for a more relaxing atmosphere. It even has a free app for your smartphone to control it for afar, because everything seems to have an app now. Available in 4 colors.